Do I need to worry about bears when hiking ? Not really. Most bears don’t want to see you, and they definitely don’t want to see your dog. The best way to avoid bears on the trail is pretty simple. Make noise. Bears don’t seek out possible threats. Use bear bells, whistles, key chains clipped to your pack. Anything that jingles. How can I keep bears away from my house ? For starters, get rid of the bird feeders. I know, I know. you love watching birds from the big picture window. But whether it’s sugar water for the hummingbirds or seed for the Blue Jays, its all snacks for the bears. Bears don’t visit homes for their aesthetic value, they are seeking out consistent sources of food. If bears are something you don’t wish to see around your property, then make sure to clean your grill very well after use , keep your trash inside as much as you can and as airtight as possible if you are keeping it outside. Do you have blackberry bushes on your property? Apple trees? Bears love those. What should I do if I come into contact with a bear ? If you happen upon one of these furry creatures, keep your cool. 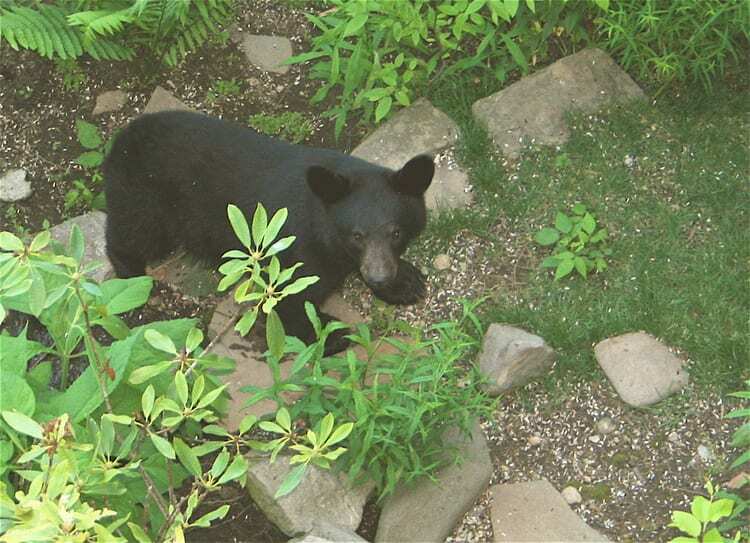 Most bears are not looking for confrontation and will walk away from a potential threat. If a bear does not immediately leave your area upon seeing you, then slowly backing away from it is a great plan. The most dangerous situation is to be between a mother and her cubs. Should you find yourself in this scenario. try your best to move to where the mother can have a direct line of sight to her little ones. A bear will not roar or show its teeth to signal an attack. Rather it will pin its ears back and begin hitting the ground with its paw. Carrying bear spray in an area with multiple bear sightings is never a bad idea. Bear spray is essentially a big can of pepper spray that shoots 15-20 feet in a concentrated stream. The good news is that you don’t have to actually hit the bear with the spray to be effective. Thanks to the bear’s highly sensitive sense of smell, Any spray in its general location will drive the bear away. REMEMBER: Only use spray on a bear that has somewhere to run off to. Using bear spray on a bear that is cornered or trapped without escape could cause the bear to run straight at you! Minus the bear spray, the best defense is to raise your arms and make yourself appear very large while yelling and making lots of noise.